Carry your tablet and other small essentials in this premium lightweight sling bag designed specifically for tablets up to 10.1”. Tabsling features a superior quality inner lining. The durable and adjustable sling adds on to the functionality. Moreover, Tabsling is water-resistant, hence, you need not worry about those accidental splashes. Carry this bag wherever you go. Tabsling is fashion design sling bag who wish to make a style statement wherever they go. This tablet sling bag provides protection from bumps, debris, and other accidents your laptop may come across. Perfect for storage or when you are travelling. 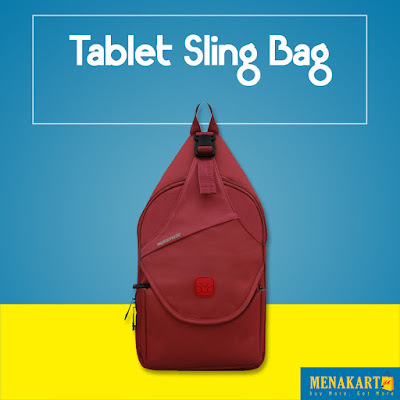 THE TABSLING sling bag was designed to protect and hold your tablet while on the move. The sling bag features multiple storage compartments and features for additional supplies and accessories. Waterproof made fabric, Tabsling features a superior quality water-resistant inner lining that protects against splashes. Carry tablet up to 10.1 inches safely with the secure & soft-padded interior tablet storage compartment.